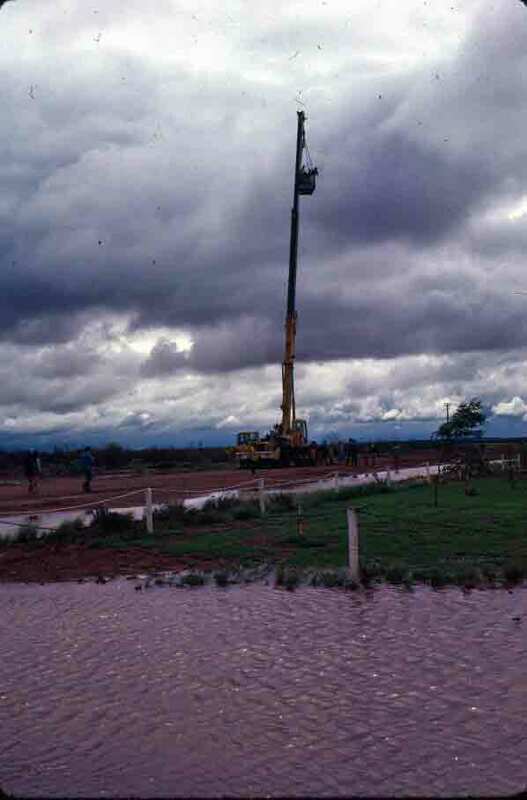 When the rain let up after a few days, the railroad crew stuck with us at Marla Bore brought out a crane to use to try to spot people who were stuck in the flood and trying to get to higher ground. After the serious work was done, they offered to give us rides in the bucket. The thing I don’t mention in the book (because my mom would see it there) is that the bucket had no bottom. It had completely rusted out. All that was left was a narrow ledge to which the bottom was once bolted. So we stood in the corners, with our feet pressed tightly into that 1/2-inch of metal with its empty bolt holes, wrapped our arms through the chains that held the bucket, and away we went (though just a couple of us at a time). Because there was no bottom, we were pretty much stuck taking photos in whatever direction we were facing when the bucket was aloft, so I didn’t get the most dramatic image of the flood (the really impressive fields of water were in the opposite direction), but I got a nice overview of the motel at Marla and the surrounding watery wilderness. It was a fun and unexpected thrill, and a great way to scan the horizon. The rain that had triggered the playing of “Send ‘Er Down, Hughie” did not let up. We watched in astonishment as the Red Center turned into the Red Sea. Fortunately, we made it to a patch of high ground at Marla Bore, a tiny outpost with not much more than a gas station, restaurant, small motel, and equipment for railroad workers. We would get no farther for some time. The photo below was taken on day three of our enforced stay, when the rain began to let up a little. The rain had begun by the time we pulled out of Coober Pedy, but we continued north. As the rain came down harder and harder, our guide, Carl, turned on some music. 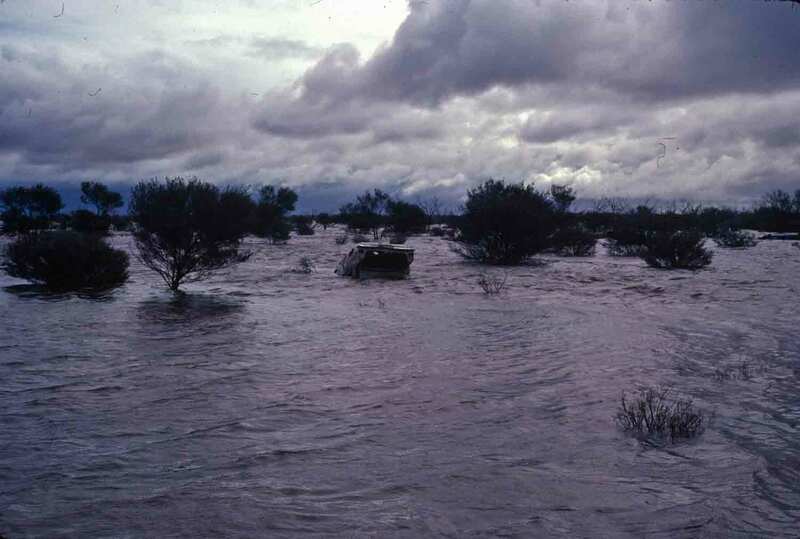 He chose a song about a truck driver trapped in the mud because of an outback downpour. The song was titled “Send ‘er Down, Hughie,” and we all appreciated the sentiment, as the rain seemed to be gaining force. 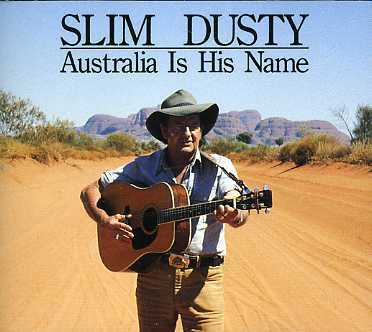 But this wasn’t just an appropriate song, this was my introduction to a man I would come to really love, Slim Dusty, the iconic Australian country singer. He’s gone now, but he was a true mega-star and was still alive when I made that first trip to Australia. Now Country and Western music is not a genre I pursue in the U.S.—too many “he done me wrong” lyrics. But here was a man who was singing, usually with great good humor, about the realities of life in a country that is magnificent but not often easy. As the songs continued to play, I knew I’d have to buy recordings before going home, because this man’s music so perfectly captured both the history of Australia and what I had experienced of this land. The album cover below, one of five albums I picked up on that first trip, pretty well sums it up: Australia is his Name. The next stop in our northward journey was Coober Pedy, were we would spend the night. Fortunately, we had most of the afternoon to explore this remarkable town. 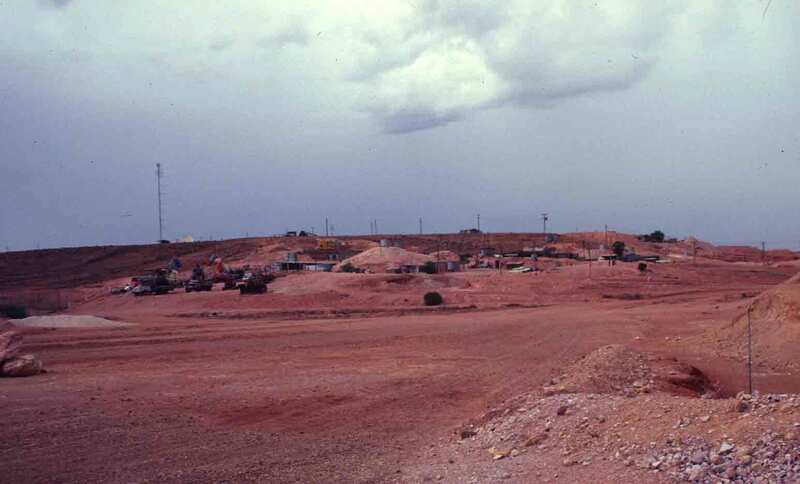 Sometimes called the opal capital of the world, Coober Pedy is indeed a mining town, and many of the not quite 2,000 people who make this there home are occupied by mining opals, cutting opals, creating opal jewelry, selling opals, and often all of the above. The thing that makes Coober Pedy remarkable is the way in which people live—pretty much all underground. Unlike the mud dugouts of Burra, these are rock-walled homes that are often quite spacious and comfortable. But they are underground. If you look at the photo below, which is of the bustling center of town, you’ll see that there are electrical wires and water tanks, but not much sign of buildings. Homes, stores, and even a church are carved into the tan rock. In some cases, digging out your home can pay off in more than just a place to live, because veins of opal run all through the area, and finding it wherever you dig is a possibility. Aside from avoiding the expense of having to ship in building materials, this approach to creating living spaces has the added advantage of helping folks avoid the heat. Summers can be brutal here, but the temperature is considerably cooler underground. We were delighted that our accommodations were also underground. Worth noting in the photo below is that the lovely mares’ tale clouds from earlier in the day had come together in a soft, billowing, ominous covering of clouds. 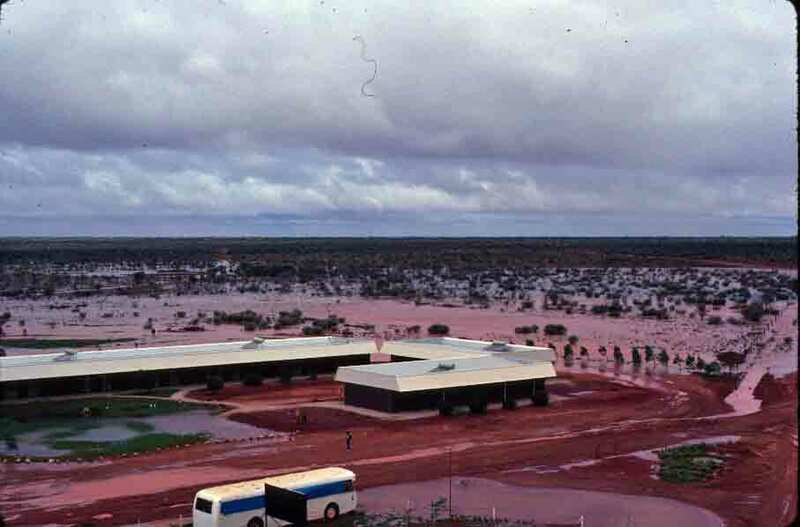 It was hard to imagine rain in the outback, but we thought we just might see some.